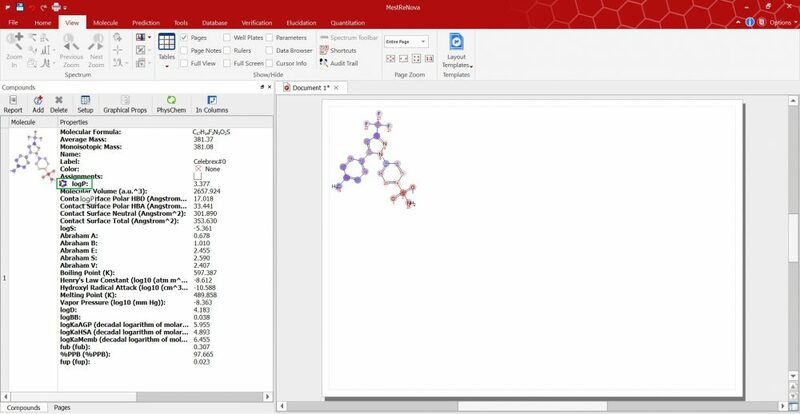 In this short tutorial we would like to show you how to use the Mnova PhysChem plugin so that you can predict the physico-chemical properties of your structures. 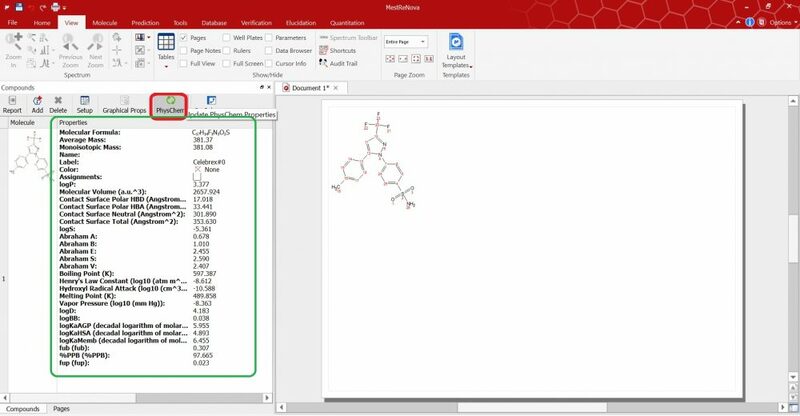 The most common structural properties are included within Mnova with your PhysChem license. For some special properties you will need to purchase a separate license. First thing you should do is to open a structure file in Mnova. Go to ‘File’ and browse a suitable .mol file in your computer. 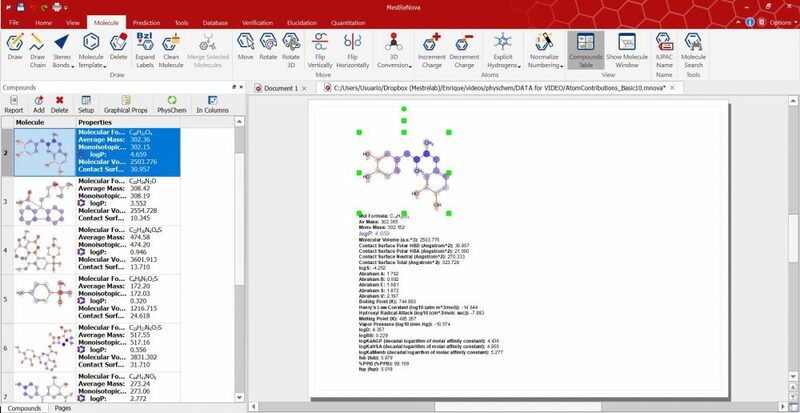 As you can see the structure is automatically opened in the Mnova’s Molecule tab. 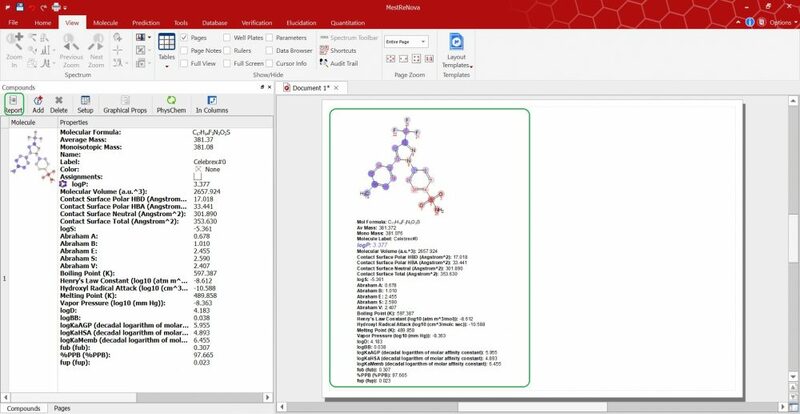 On this table you can see the molecule and the list of the common properties we can calculate. Now you just need to press the ‘PhysChem’ button to display the values of all these basic properties in one go. 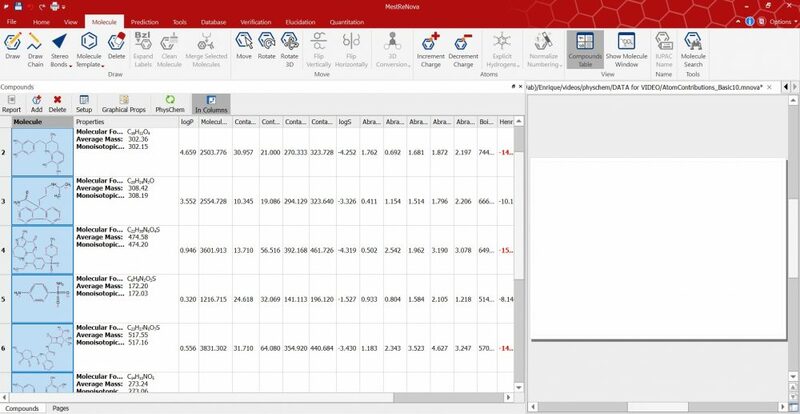 An added feature to this tool is the ability to calculate the atom contribution. To obtain this, just click on any of the properties and the atom contribution for a particular property will be displayed using different colours. You can easily see the atoms contributing most to the property value coloured in blue and red. Atoms will be displayed in grey when they hardly contribute. You can also report these properties values just by clicking the ‘Report’ button to see them all in Mnova’s main window. You can see highlighted in blue the property we want to report and its atom contribution or change it to the desire one as a kind of a dynamic report. 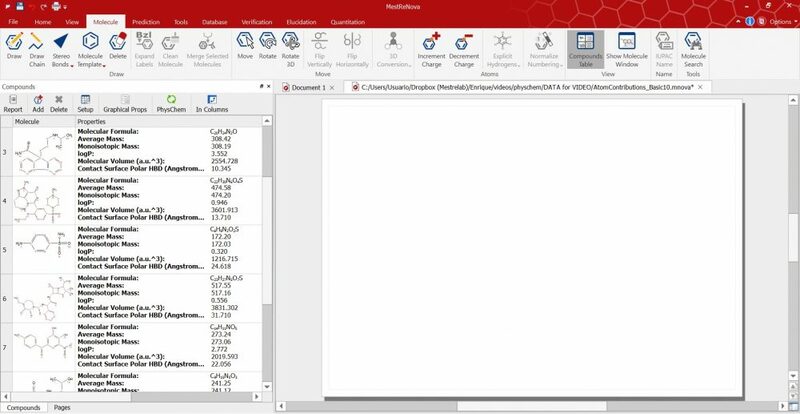 The Mnova PhysChem module can also load a batch of molecules by opening an sdf file. In this case we have got 10 different molecules. Using the ‘In Columns’ button we can display the properties also in columns. You can select one property and obtain its properties or select all the molecules. You can also select any of the properties and display the atom contribution. 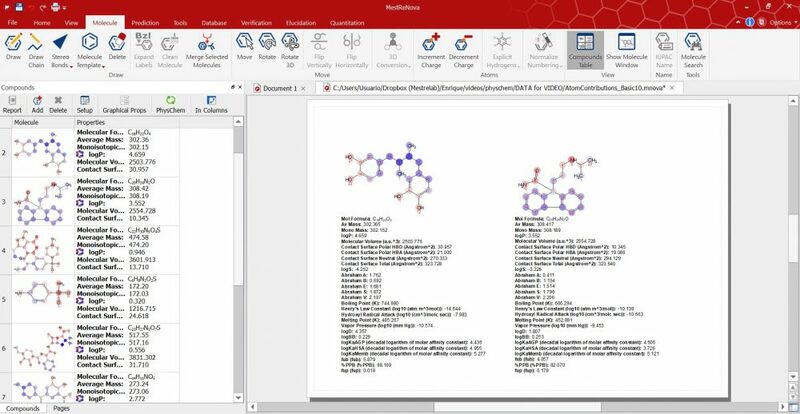 If for instance we select two molecules we can report these ones on the Main window. Then we can resize and refit them around the screen as we wish. 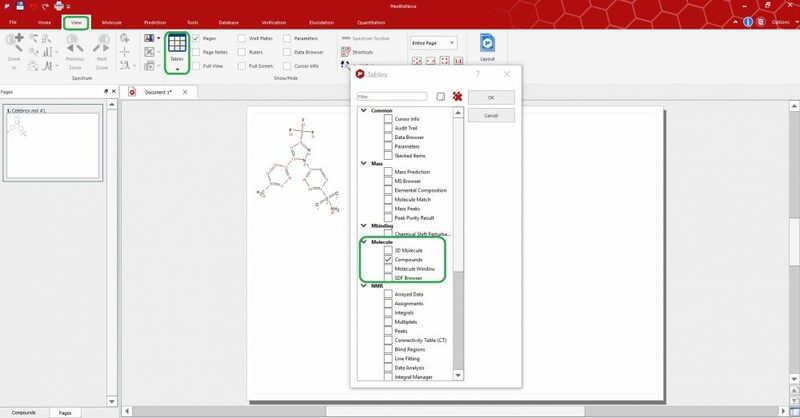 If you want to report all the properties for a particular molecule of the batch, highlight it, click report and click on “selected row”. If you just highlight a molecule you will just get the report of the selected property. And finally this is the list of the “special” properties for which you need a separate license.